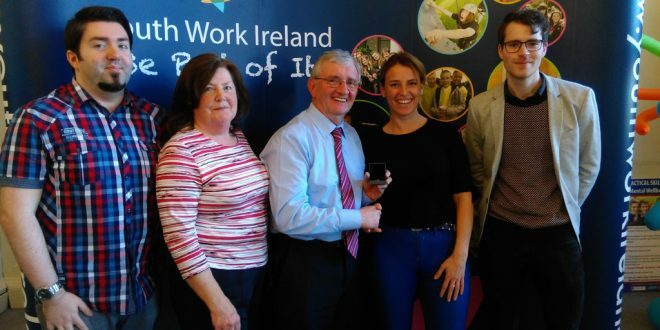 Clare Youth Service volunteer, Nicky Brennan is presented with his Extra Mile Award by Senator Lynn Ruane with, from left, son Killian, wife Eileen and Eoghan O'Neill President Youth Work Ireland. Clare Youth Service volunteer, Nicky Brennan has been presented with the Extra Mile Award, the prestigious annual accolade of Youth Work Ireland. Nicky has been involved with Clare Youth Service for over 43 years and is the longest serving volunteer involved with young people in the county. Over the years, he has been involved in several youth clubs in Ennis and since the early 1980’s, he has devoted countless hours to supporting hundreds of young people through the medium of music primarily. “Underpinning all of his work has been a commitment to supporting young people to take a leading role in developing the projects and clubs as well as supporting their personal and social development.